Mary & Gavin’s story is an emotional one with a fantastic connection to the past. Seeing the early childhood photos reminds me of my own story, and how I grew up riding in my Grandpa’s ’67 Beetle that I now own today. Thanks for sharing, guys! 1967beetle.com exist because of people like you. It was through a search on EBay Motors in early May 2015 that we happened upon our 1967 VW Beetle. The car was originally purchased at North Import Motors in Chicago, Illinois where it remained with the original owner until just a few years ago. The death of the original owner, who lived to the age of 100, saw the “mostly” original 67’ Beetle bought & sold to a few neighbors until it came to us as its fourth owner with 82,500 original miles. We were immediately impressed to see ALL of the one year ’67 model parts intact, even the infamous dust cover on the rear deck lid latch! According to the VIN our bug was born in October of 1966 in West Germany. The only thing that we have replaced is a period correct AM/FM Sears radio with an original Sapphire V radio made for this Volkswagen sourced on Ebay. The transient smell of the coconut fiber seat pads and the forty eight years of patina on the headliner further confirmed that the interior is absolutely original! 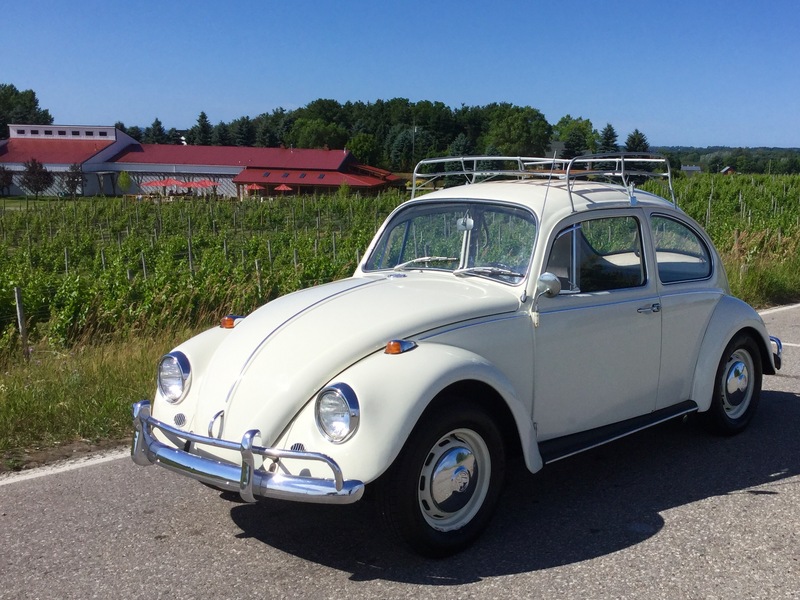 As you can see in the photos, we added some 1967 VW “bling” courtesy of Lane Russell in the form of the Bambus tray, a Roof Rack, and Hub Cap pullers. 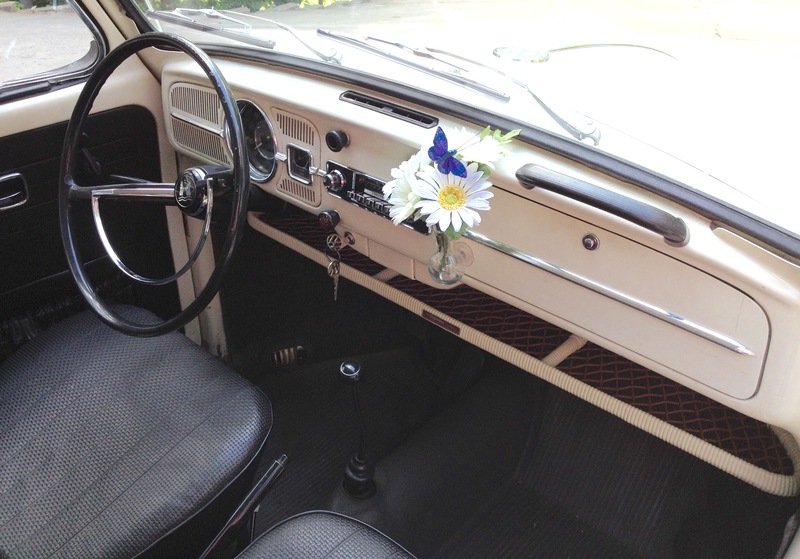 In addition, an aftermarket vase adds a bit of flare to the quaint dash area. Along with new brakes, the exterior and rims were painted in 2009 and we have plans to return the rims to their original black and white this winter. We are in the process of acquiring some vintage luggage, cooler, and other nostalgic VW antiquities to compliment the floor pans and battery tray which are original to the vehicle with no holes or rot . It goes without saying we are blessed to have found a wonderful 67’ Beetle that was revered and cared for her last 48 years by previous owners. We are proud to carry on the legacy of our ’67 Beetle as we make her “road ready” for the car show circuit in Northern Michigan and specifically the Traverse City area where we reside. My love affair with Beetles started in May of 1974. My father purchased a brand new Gold 1974 Volkswagen “SUN BUG” that my mother fell in love with and picked out. Dad and I went together this day to the Westport VW Dealership on Milwaukee’s West Layton Avenue where dad put “one dollar down” and with his humble, happy grin my dad drove us home down Layton Avenue in what seemed like a large vehicle to a six year old. 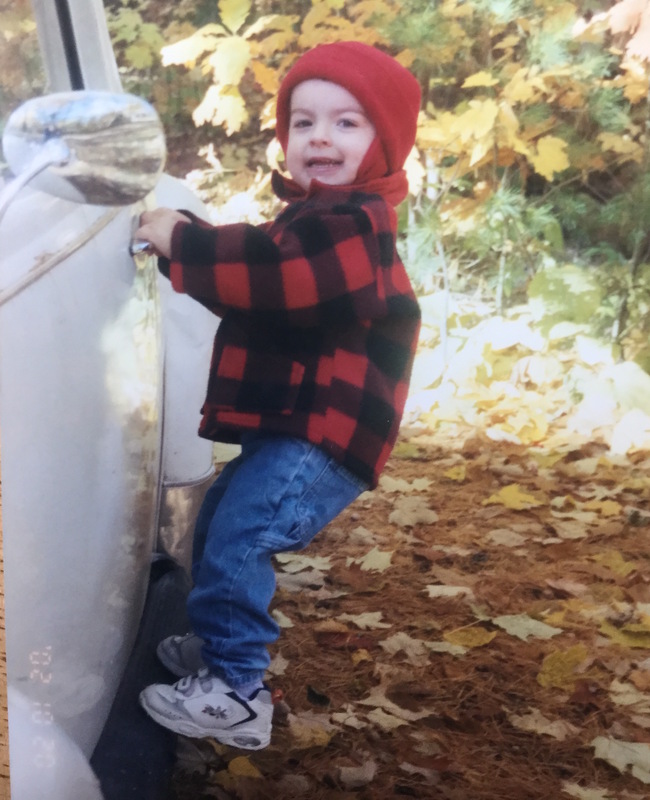 As I recall, I couldn’t see over the dash, no car seats in those days, so I just sat on the edge of the brown corduroy passenger seat clinging to the handle grip on the dash and studied my dad’s face watching him drive down the road getting acquainted with the new family ride. This was our family car for several years. With the sun roof wide open, windows rolled down (weather permitting), and the constant tornadic swirl of Tareyton 100’s ciggy smoke and ashes from the cigarettes of my chain smoking parents the Sun Bug was the the mode of transportation for my parents, sister, and I on the five hour annual summer trip to Michigan’s Upper Peninsula each June to visit relatives. One of the highlights of the five hour journey each summer was the “mandatory stop” and unofficial half way point in Fond Du Lac, Wisconsin the home of “The Stretch” truck stop. Here we got a bio-break and could get the finest “greasy comfort food” on the planet. Well ok, the finest in the State of Wisconsin! We would use The Stretch stop to fill the tank with petrol before continuing north drafting off the rear end of semi-trailer trucks on US Highway 41 excited about our next stop, the “Cheese Outlet.” This WAS the high point! I knew dad couldn’t resist, nor could I, those delicious Wisconsin cheese curds and summer sausage bites. Of course, we happily purchased the economy size bags that dad skillfully, carefully, and ceremoniously opened and nestled between the front seats of the Sun Bug perfectly perched atop the emergency brake and the air vent levers creating two handy, sturdy “feed bags” that I trust could have been mistaken for an OG VW accessory! Not a curd or bite of sausage went to waste from the well placed bags as we all dug in and enjoyed our feast on our way to grandma’s house!! It was 1983 when the Sun Bug left us for good and forced us to find an alternative mode of transportation. Although still in running condition, the floor pans, brakes, and brake lines had seen better days! Rusted out from years of salty Wisconsin & Michigan winter roads it was now a qualifier as a “Flintstones” mobile. We could go nowhere if it might rain or we risked getting soaked from the errant jet spray of road water shooting thru the rotted floor pans….it was time to move on. Although I have just one picture of the Sun Bug (above), I do have the owner’s manual on display in my home office next to a vintage map of Milwaukee as a reminder of the car and the fond memories of Milwaukee, trips to the UP, and that “special day” I picked up the Sun Bug with my dad in May of 1974. This is actually a tale of two 1967 lotus white VW bugs. 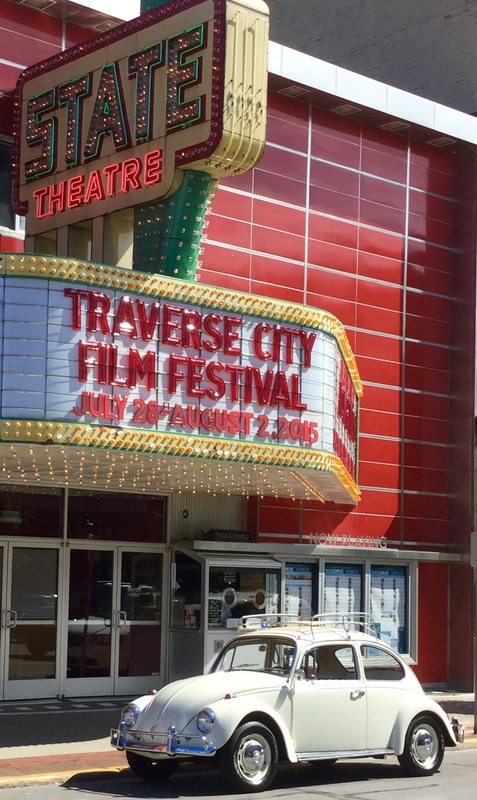 The first tale starts in Marquette, Michigan where I acquired my first 67’ VW sedan as a college student attending Northern Michigan University. Now, fast forward from 1983 to July of 1990 where I was working my way through my senior year of college and gleaning through the classifieds of our local newspaper, the Marquette Mining Journal. 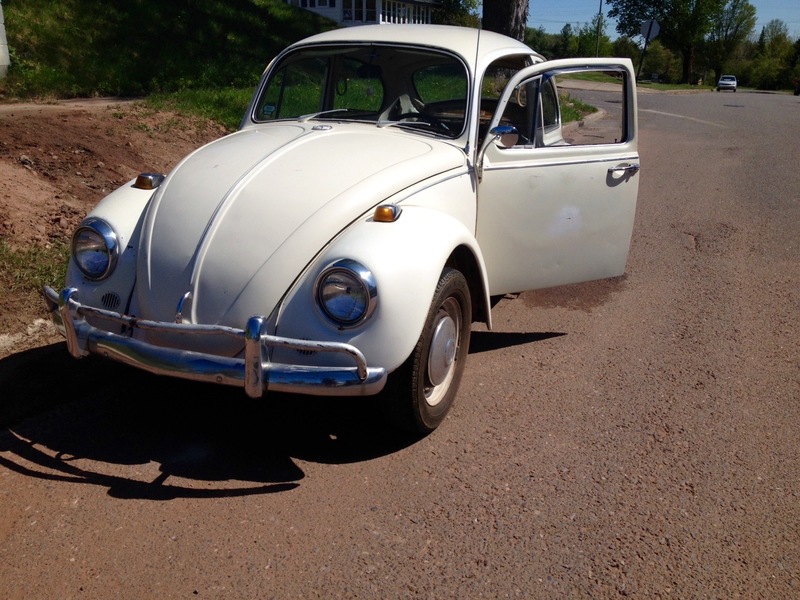 I was looking for nothing special, but there it was; a “1967 VW Beetle For Sale -$1000 or Best Offer.” Hmm. Wouldn’t it be cool to own a bug the same year of my birth, 1967? It goes without saying, having no idea of the significance of this model year, that I bought the car and took possession of it and several other miscellaneous parts the previous owner had purchased with restoration in her mind. However, her plans to attend college next fall and the dollars to do so foiled her restoration plans and now I was the proud owner and steward of my first 1967 Beetle. In a 1990 world, I found myself at a loss when sourcing parts. No Google, no Internet, no email or websites. 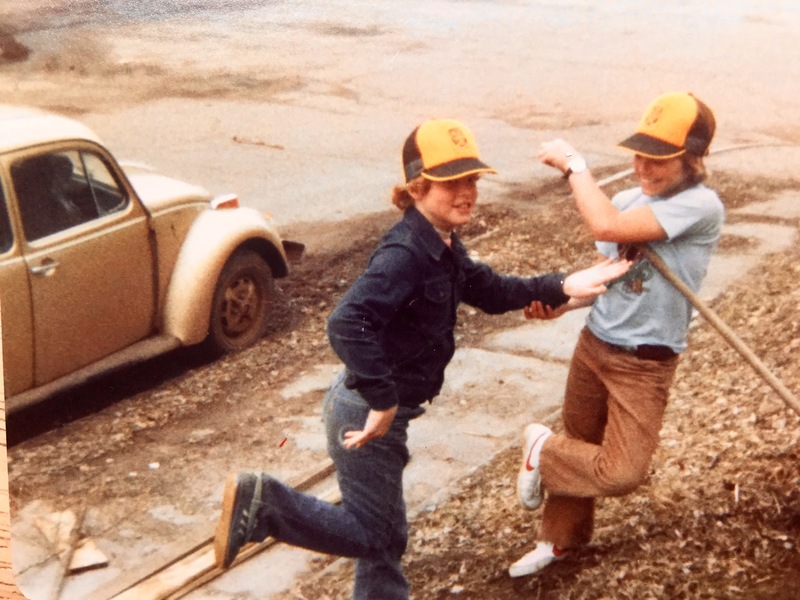 All I had was a JC Whitney catalog “snail mail” connection and a local junkyard with a few salty and rusted relics that were once “road warrior” VW beetles. Finally, by chance, my mechanic told me to give Parts Place for VW near Detroit a call. The guy I spoke to on the phone had empathy for me and my situation and asked, “You have a 67’ beetle?.” “That’s a one year model, nothing is available.” The only good news was that he could find and retrofit other model year parts from his vast array of parts available in the shop. Oh boy! (That’s not what I really said)….What have I gotten myself into, I thought? I ordered a few things such as tail pipes, a muffler, and other, homogenous stuff, and just decided to drive it “as is” and have fun with what I had…my 1967 Beetle! Much has transpired since 1990. I graduated from college in spring of 91’, the advent of the Internet, married my beloved wife of 20 plus years, started a wonderful family, made great friends, and built a rewarding career. My beloved father and VW mentor sadly passed away in April of 2002 and the Beetle sat quietly in storage for most of the last 25 years waiting for its’ time of restoration. Needless to say, we had a blast when we did bring the ol’ Bug out to play! Not knowing much about Beetles outside of the odd transient smells of old stale coconut fiber and gas fumes, a calling card of most classic bugs, my wife warmed up slowly but surely to the VW nostalgia and idea of getting her road ready after we attended a vintage VW festival. . One thing you need to know about my awesome wife is that she can source anything on the Internet and I believe this restoration idea presented her with a new challenge to test her skills. She is a “master” in her own right at making things like this happen! 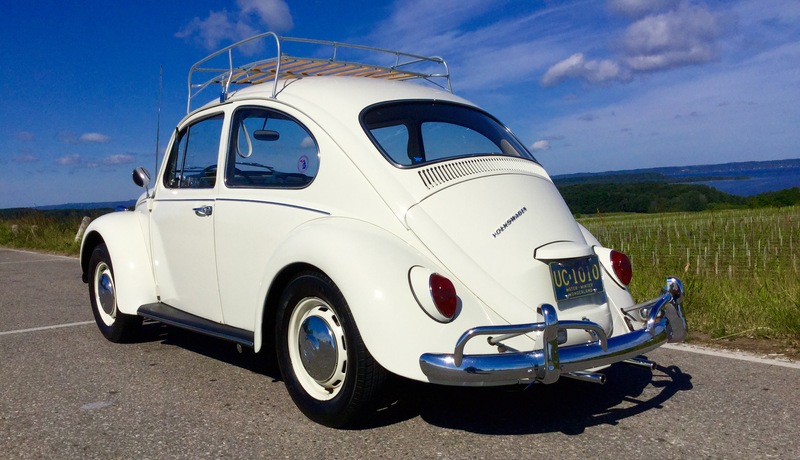 In fact, we got several hundred dollars into the restoration and then one day in May 2015 while sourcing parts for Bug #1, my wife happened upon an original 1967 Beetle on EBay, (yes, the one in the feature). She says, “You need to take a look at this…I’m not sure what “Original” means but maybe you can give him a call?” Armed with my list of “one-year parts” compliments of 1967beetle.com and videos from Chris Vallone, I was ready for the shakedown! The questions to the seller flowed rapid fire, the answers were affirmative….I was getting very excited now! However, there was some bad news, I was told it might be sold! My heart sank… “How sold?” I asked. “Well a guy from another state has promised to put a down payment on it” came the response from the seller.”OK”, I said. ”If anything changes, let me know.” No worries! After all, I already had one 67’ waiting for it’s debut. Luckily for us, the previous deal did not move forward and we were able to purchase the Bug and have it shipped to Traverse City! Mind you, this was a purchase “sight unseen.” Outside of a phone call, we hadn’t driven the car or even seen it other than the series of photos provided by the seller on EBay and an instinctual sense that we could “trust” the seller. You could imagine our anxiety immediately followed by pure delight, when the ’67 arrived rolling off the delivery truck exactly as described. She ran great. No exhaust smoke at all. There was just that unmistakable engine chirp complimented by beautiful paint, an original relatively clean and tear free interior and,yes, floor pans that were a bit grubby but no major rust or holes. Indeed, we thought to one another, this is the “Holy Grail” of 1967 VW Beetle survivors! Perhaps you’re wondering….what about the first Bug? Restoration? Sold? The suspense is killing me!! All I can honestly tell you is that our first Beetle has matching numbers, was born in August of 1966 and is a permanent member of our family. It was my college summer ride and a daily driver back and forth to work for a few summers in the late 1990’s. It chauffeured our two babies around in slow neighborhood “bug rides” where they honked the horn laughing and drooling. It sported dozens of little multicolored chalk handprints made in our driveway by the neighborhood kids. Handprints that, when washed away by the sprinkler on hot summer days, covered the Beetles’ poor paint job. Today, I am proud to say the babies have grown to become outstanding licensed teen drivers bitten by a “bug” of their own. 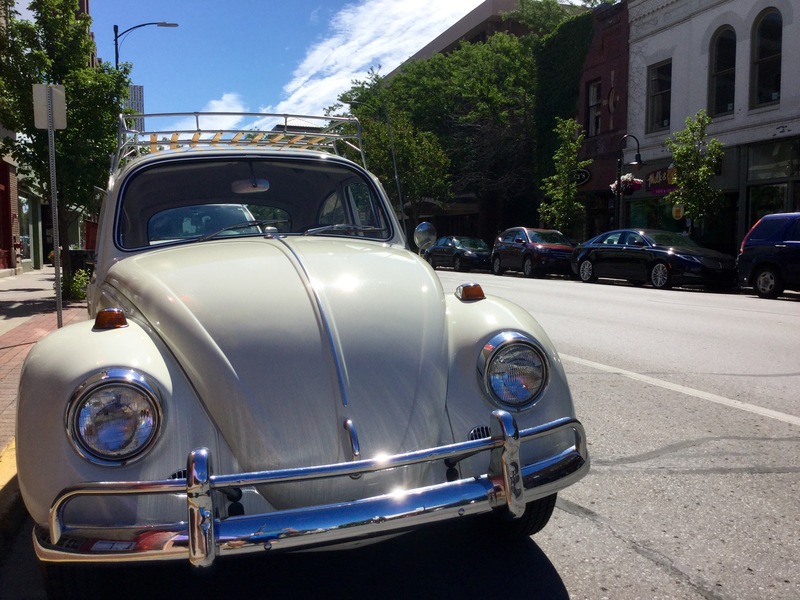 Their “’67′ bug rides” of the past have yielded to a quest for cash and keys. 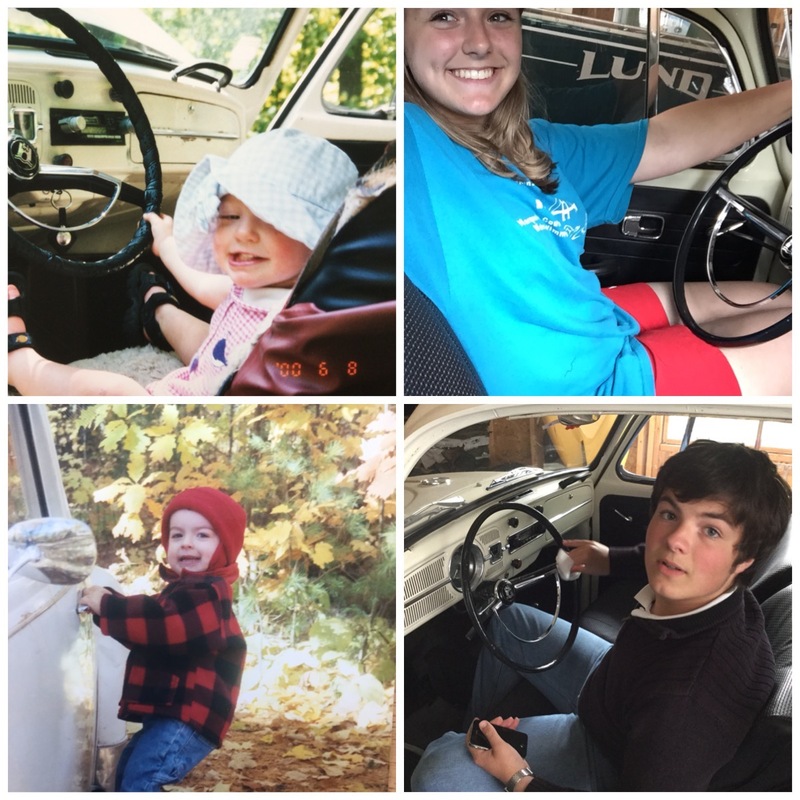 “My wife and I are happy to provide our two children with access to these great memories through the simple turning of a key in the ignition switch of a ’67 Beetle. It fills us with joy to do so. Hence, a third generation has been bitten by the BUG! Thanks, guys, for sharing your story with 1967beetle.com. Great story! Great car! Great Photos! The jury is still out on that bud vase though. Vases in general seem hard to locate. We’ve been trying to source them with not much luck. Great car! I agree with Mike! Great story and photos! Reading about the rust from road salt makes me appreciate our dry climate here in California! I have always considered the bud vase a woman’s touch and never felt compelled to find one for my ’67! But at a car show they do make the car fell friendly! Also, I wanted to let everyone know I’m really sorry for the downtime. We’ve been growing a lot, and our server is having issues handling the site traffic. We are doing our best to get it figured out as soon as we can. My favourite colour for this year. One of these days I hope to buy a 67 to match my sea blue 66 and L87 whit 71 Westy. I have been watching these prices soar the last five years. One of these days I know I will find a decently priced sedan. Great looking car! Thanks for sharing. Great car, great story, great photos, GREAT FAMILY!! Thanks, Neva. Sorry if the site has been down. We are having some real issues..
Great car. Even better story leading to them. Thanks everyone for your kind words! The vase is temporary until we find the right “Rosenthal” vase. We plan to enter several car shows and exhibit all the amenities of this wonderful beetle! Your story reminds of mine too. I bought a new 1967 Volkswagen 1500 in Hamilton, Ontario. I must say that reading your site has inspired me to the point that I will now aggressively search out an original 1967 Volkswagen 1500. Thank You so much for the inspiration.